I have blogged several times here also about the French fairy, Melusine of Lusignan, whom I consider a marginal part of Arthuriana since Melusine was raised on the Isle of Avalon. 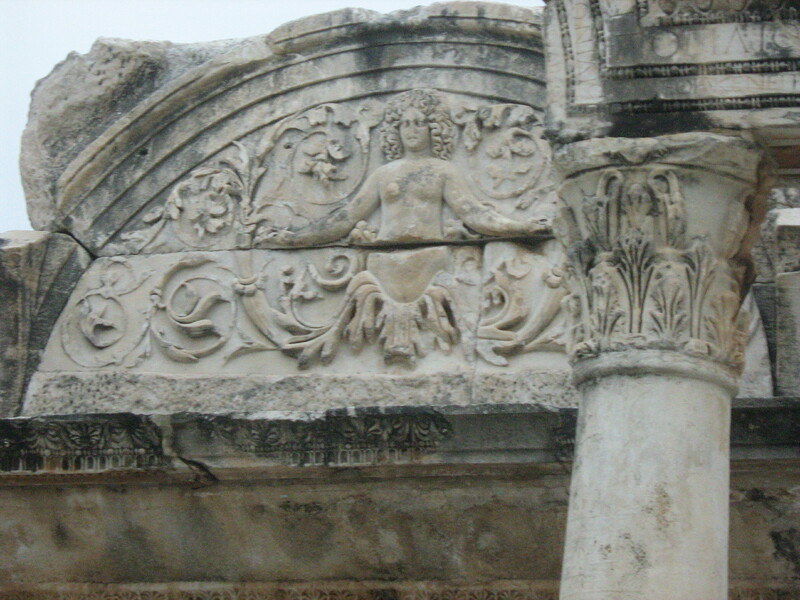 Image of Medusa in Ephesus, Turkey, which closely resembles depictions of Melusine. While I was visiting in Turkey the ruins of Ephesus (best known for St. Paul’s letter to the Ephesians and because the Apostle John and Virgin Mary settled there after Jesus’ ascension), I was stunned to see a depiction of Medusa. We all known Medusa as the woman in the story of Perseus who has a head of snakes, and if you look upon her, you would be turned to stone. Perseus uses his shield so he only has to look at her reflection and can cut off her head. At Ephesus, the image of Medusa closely resembles many images of Melusine. Medusa is depicted with what look like two fish (possibly serpent or snake) tails. This image is close to that well-known image of the mermaid in the Starbucks logo and many other depictions of Melusine. Melusine is herself believed to be based in earlier mythologies of water spirits or goddesses and Medusa is probably one of her literary or religious grandmothers. Their stories have similarities. According to Wikipedia: “Medusa was originally a ravishingly beautiful maiden, “the jealous aspiration of many suitors,” priestess in Athena’s temple, but when she was caught being raped by the “Lord of the Sea” Poseidon by Athena‘s temple, the enraged Athena transformed Medusa’s beautiful hair to serpents and made her face so terrible to behold that the mere sight of it would turn onlookers to stone. In Ovid’s telling, Perseus describes Medusa’s punishment by Minerva (Athena) as just and well earned.” Well-earned is questionable. Does being raped deserve such punishment? Melusine also acquires her serpent form at the rage of another–her mother Pressyne, who curses her after Melusine and her sisters lock up their father in a cave where he dies. A typical depiction of Melusine. I’m not the first to note the similarities between Melusine and Medusa. An interesting book that discusses Melusine’s connection to more classical myths is Gillian Alban’s Melusine the Serpent Goddess in A. S. Byatt’s Possession and Mythology. Turkey is a beautiful country and well worth a visit, whether or not you are in quest of ancient myths and legends. 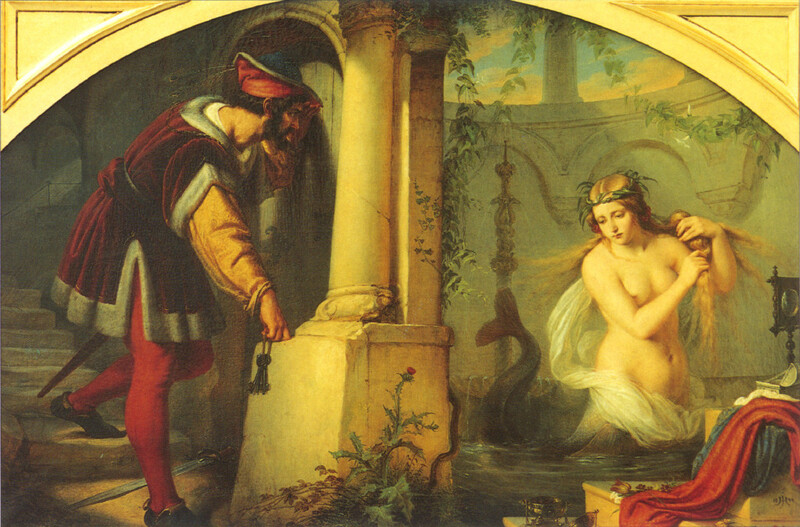 Julius Hubner's 1844 painting of Melusine.